Inspired by my foody friends , I was tempted to try this recipe for my family and guests. 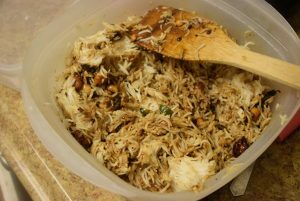 I was happy to re-create this tasty rice dish in home ,after having countless times in restaurants. 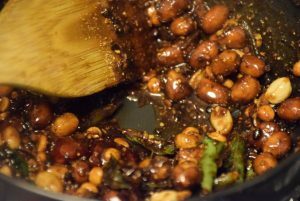 This recipe surely will be a keeper for you, since I have added the method to prepare Puliyogare masala too. 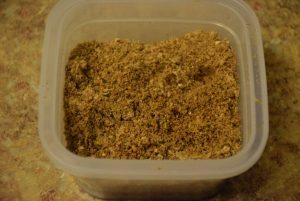 This spice powder can be stored like all other spices for future use. 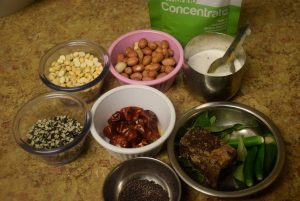 This is a common meal in South Indian homes and is very popular there. 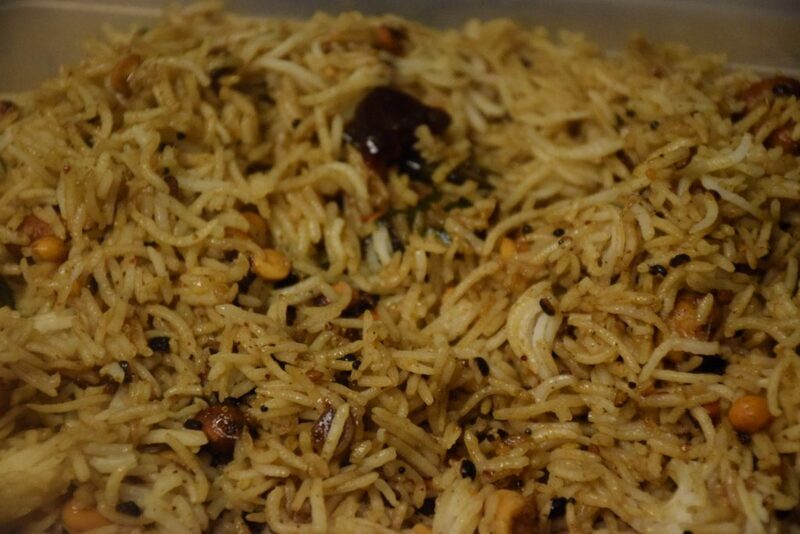 So whenever, you feel like eating spicy, tangy rice opt for them and you would be satiated. So lets check it now..
1. 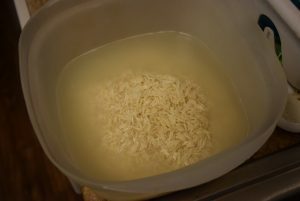 Wash and soak the Basmati or Sona Masoori rice in water for 30 mins. 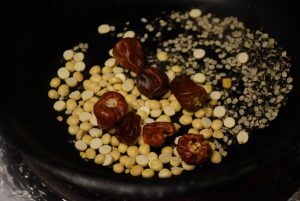 Also soak the tamarind in water . (I have used the tamarind concentrate -store bought). 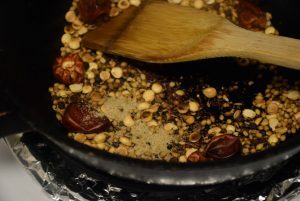 In the meanwhile let’s prepare the spice powder – Puliyogare masala for this dish. 2. 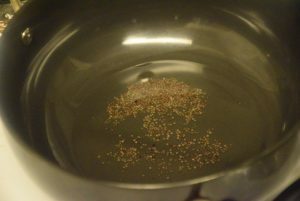 Take a non-stick pan or small wok. 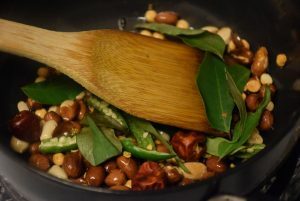 Heat it on high and then add the urad dal and chana dal into it. 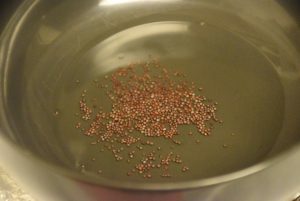 Lower the heat to medium and dry roast them on low to medium heat till they smell aromatic. 3. In the same pan, add red chillies now . Dry roast them for 2 mins. 4. 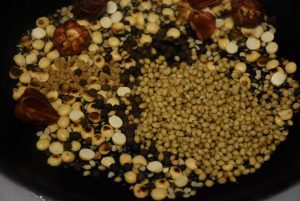 Next goes in the mustard seeds(rai), the coriander seeds(dhana),sesame seeds(til), peppercorns (kali mirch),hing and the fenugreek seeds (methi dana).Dry roast them for 3 to 4 mins or till they smell aromatic. 5. 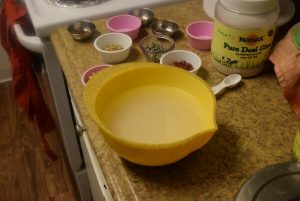 In the end add the dry dessicated coconut or coconut powder . 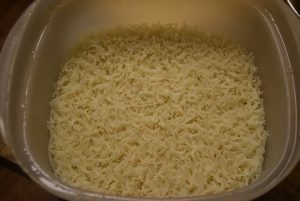 Stir them continously on low heat till you see slight change in color of coconut powder. 7. 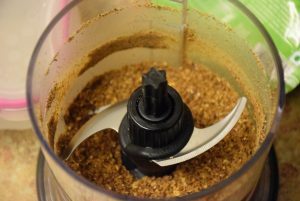 Ground the cooled roasted whole spices in fine powder using a grinder or mixer jar. Puliyogare masala is ready to use now. 8. 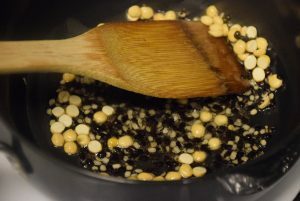 In the same(or different) wok , now add oil and mustard seeds and let them crackle on high heat. 9. Next add the Urad and Chana dal and roast them in oil for 4 to 5 mins or till they change slight color. 10. 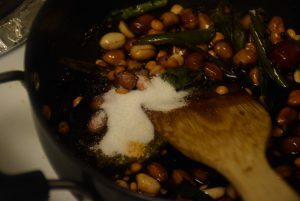 Add the peanuts and roast them in the seasoning (tadka) . 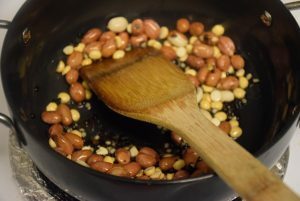 Also add hing now and continue to stir for even roasting of dal and peanuts. 11. After this, add the green and red chillies and roast them with the mixture for a minute. Add curry leaves and stir them in the tadka. Lower the heat and continue roasting. 12. 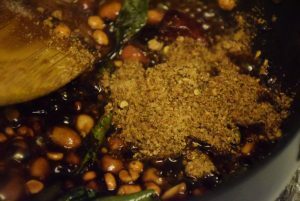 While it is getting roasted, add the jaggery in tamarind water and mix it well. 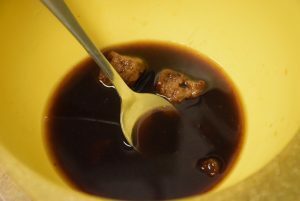 Since I have used tamarind concentrate , I warmed the water for jaggery and then added concentrate(2 tsp) and jaggery to it. 13. 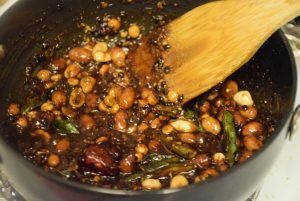 Add the tamarind-jaggery water to the tadka and let it come to a complete boil. Keep stirring in between. 14. 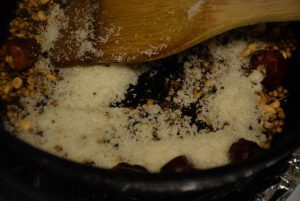 Once the mixture starts boiling , add 2 tbsp of Puliyogare masala, salt and lower the heat. 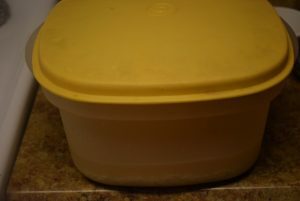 The mixture would start thickening and when it reaches a thick liquid or honey like consistency, turn off the heat. 15. 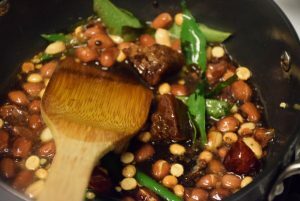 If you feel that the tadka has dried up and thickened a lot, add 3 tbsp water and cook again to adjust its consistency. It should be a miscible thick liquid. 16. 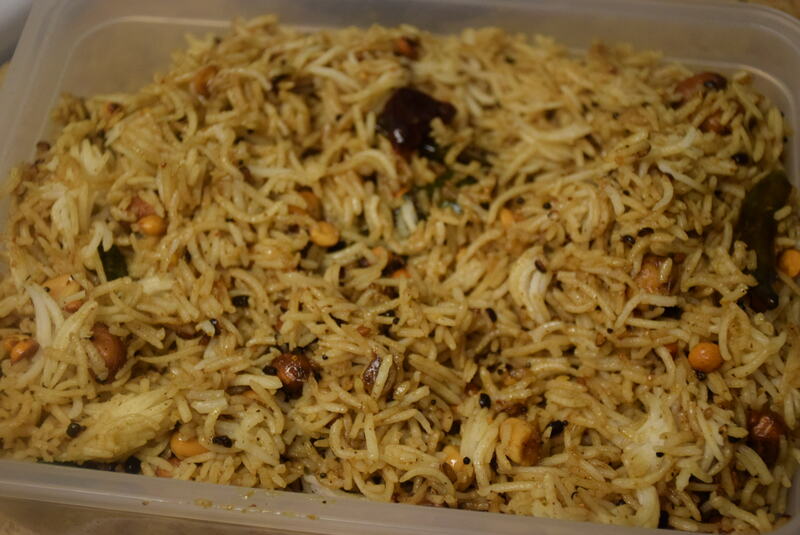 Serve it in your favourite platter and enjoy with your family and friends !! 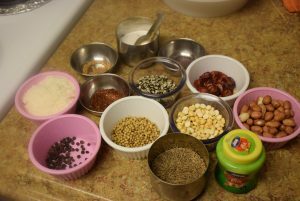 This entry was posted in Food, Main Course, Recipes and tagged adds tadka to your meal, adjust spice level, afternoon meal, Carenshare, delicious, dhania seeds, dinner, dry-fruits, easy, Gur, hing, imli, jaggery, kashmiri mirch, khatte chawal, leftover rice, methi, please your guests, Puliyogare, Puliyotharai, rai, red hot chillies, restaurant style, seeds, shweta jindal, sour, South-Indian, spicy, sweet, tamarind, Tamarind rice, tangy, welcome your guests, zindagisikhati.